Windows 10 Text Prediction feature was only available to software keyboard, or often known as Touch keyboard, in some Windows tablets and Microsoft Surface. Since Windows 10 April v1803 update, Text Prediction can also be turned on for hardware keyboard, which means you can use it on any computer with a normal keyboard. The Text Prediction feature is useful for spelling checking and correction, and quick typing. People tend to forget how some words are spelled. In such cases, text prediction can be a handy tool in suggesting the words you want to type. It will also automatically correct (autocorrect) words that you’ve misspelled as you type. 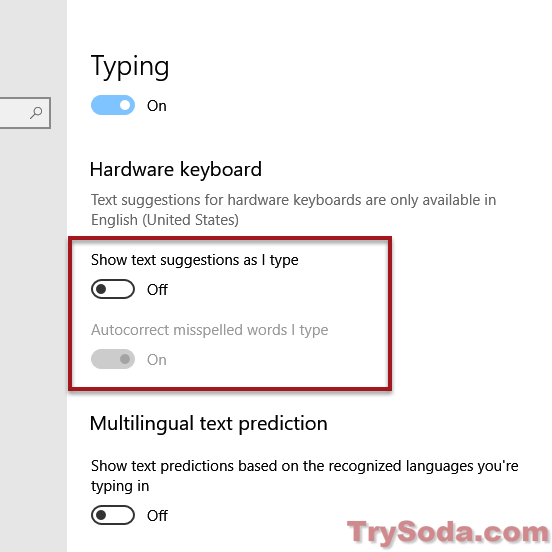 Follow the guide below to turn on text prediction in Windows 10. 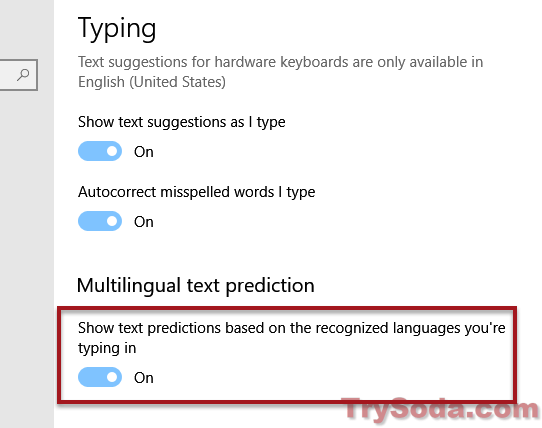 If text prediction was turned on without your consent (or sometimes enabled by default) and you are looking to disable it, follow the same guide below to turn off text prediction in Windows 10. Assuming you have already updated to the latest Windows 10 update, follow the steps below to enable or disable text prediction in Windows 10. If you’re not in the Windows Settings home, click Home at the top left corner of the window. From the left pane, click Typing. Under Hardware Keyboard, click to toggle on Show text suggestions as I type. Optionally, you can also turn on the Autocorrect misspelled words I type. That’s it. Text prediction will immediately take effect and start showing suggestions as you type now. 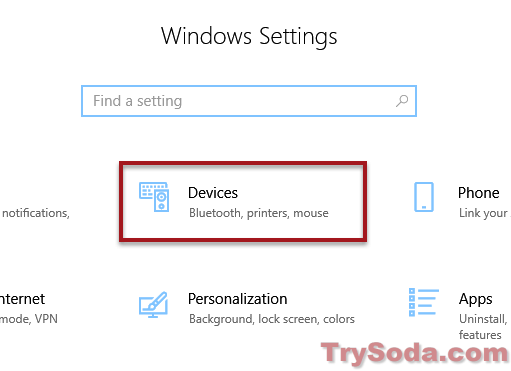 If you want to turn off Text prediction in Windows 10 instead, just toggle off the options mentioned in step 6-7 above. We were told that the Text Prediction would only work in Windows 10 apps such as Edge and notepad, and wouldn’t work in third party program such as Chrome or Firefox. However, I experimented typing in Firefox after turning on the Text Prediction, it’s suggesting me words as I write this post. So, I’m pretty sure it works in certain apps and programs, including Firefox. As you type, Windows will show you suggestions after each alphabet you enter. It will automatically detect the closest possible words that it thinks you may want to type. Use the arrow key to select the words you want then hit Enter. If you have the Autocorrect misspelled words option turned on, if you’ve entered an English word that the system detects is incorrectly spelled, when you press the Spacebar key (to type the next word), the misspelled word will automatically be corrected to the closest word the system thinks you want to type. If you are like me who don’t always type exact English words (I often type other language words in Latin alphabet), turn off the Autocorrect so that it won’t auto-correct the words that are correct to you but not to the system. As far as we know, for now, Text Prediction in Windows 10 supports English language only. Some claims that it also works for Hindi and Malay words (but certainly not perfect yet). Give it a try with your default language and see if it works. If you are typing in more than one Latin based languages, you can turn on the multilingual text prediction option to allow it to also suggest texts based on the recognized languages you’re typing. To turn on or off multilingual Text Prediction support in Windows 10, go to Windows Start menu. Search for Typing settings and open it. Scroll down until you see Multilingual text prediction. Click to toggle on Show text predictions based on the recognized languages you’re typing in. In the comment section below, let us know what languages you’ve experimented with Text Prediction and whether it works or not. 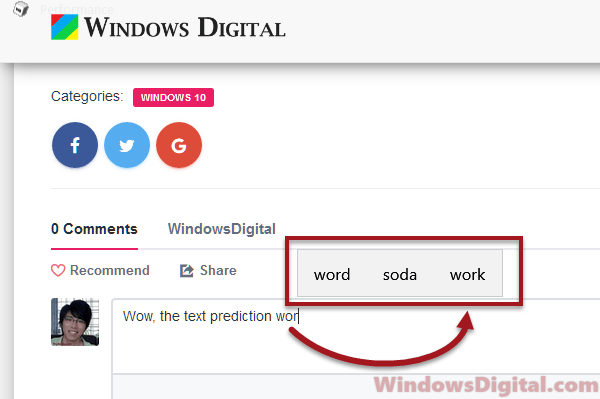 Description for sharing: If the Text Prediction in Windows 10 was turned on without your consent (or sometimes enabled by default) and you are looking to disable it, here's how to turn off Text Prediction in Windows 10.